Welcome to Wyndhurst Family Medicine! 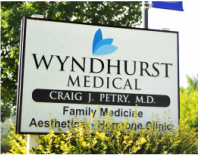 Wyndhurst Family Medicine is located in Wyndhurst, off Enterprise Drive. We have one physician, Dr. Craig Petry, and two Nurse Practitioners, Heather Cook NP-C, and Carrie McKinney, FNP. We strive to maintain a small family practice atmosphere. We are dedicated to building a relationship with our patients and their families, while providing exceptional comprehensive care. For after hours emergencies, please call 911. For non emergencies after hours care, please call (434) 237-3664 and your call will be forwarded to the on-call provider.